All NSCA CSCS exam candidates want to pass the examination on their first attempt and become CSCS certified. Currently, the cost for an NSCA member to register for the computer based exam is $340. Failure to pass any section of the exam results in additional financial costs which can be significant. An NSCA member who fails a section of the computer based exam will have to pay $250 to retake one section, or $340 to retake both sections. Failing the exam will cost a candidate $250 or $340, even if you are a member of the NSCA. A structured CSCS exam preparation plan and as well as study material represents and investment in your certification and minimizes your chances of incurring these additional costs in order to become CSCS certified. The cost of exam preparation material pales in comparison to the retake costs. When reading this plan, please keep in mind that we all come from different academic and professional backgrounds. We also bring different life circumstances that may benefit or serve as a disadvantage when studying for this exam. Study tactics that work for one candidate might not for another. What might be overkill of information for one candidate might be grossly inadequate for another. The following preparation plan should benefit most if not all candidates. NSCA members pay significantly less than non-members for the CSCS exam and study materials. An added bonus is subscriptions to the NSCA’s Journal of Strength and Conditioning Research and Strength and Conditioning Journal which are both included with membership. Joining the NSCA is a no-brainer if you are taking the CSCS exam. Essentials of Strength Training and Conditioning is the preparation text for the CSCS exam, it would be completely foolish to sit for this exam without reading it. After becoming a member of the NSCA you will be able to purchase the CSCS exam content description, and the CSCS practice questions at reduced rates from the NSCA. Glancing over the CSCS exam content description will allow you to become familiar with what information is presented on the exam, and what knowledge a successful candidate is expected to possess. It goes into much greater detail than the free information provided by the NSCA, and tells you exactly how many questions come from each subsection of a category. From the exam content description you are able to see what areas will need intense focus. After becoming familiar with the CSCS exam content description read Essentials of Strength Training and Conditioning cover to cover. Highlight key points, definitions, and concepts and make sure you take the small multiple choice quizzes at the end of each chapter. Make sure you know the rationale behind the correct answers to the multiple choice quizzes before moving on. If a chapter contains a lot of material that is new to you, pay particular attention and possibly read the chapter again if needed. When you read Essentials of Strength Training and Conditioning remember the following point. Human anatomy, physiology, biomechanics, etc, are essentially the same no matter which organization or textbook you read. Some may go into greater depth or detail but they all grow from the same root. What varies between organizations and textbooks is how this information is applied and labeled. Testing procedures, exercise techniques, and names can all vary between organizations. The NSCA develops the CSCS exam; therefore it is imperative that you are familiar with their guidelines and procedures. You can have years of experience in the gym, but this will not help if you are not on the same page as the NSCA. After reading Essentials of Strength Training and Conditioning you will have a good idea of what areas of the text need further review. You can base this on how well you did on the multiple choice questions following each chapter, as well as how easily you comprehended the material. For some it might be the exercise science section while others it might be the practical/applied section. Then go back and review the CSCS exam content description. Make note of each question you do not have the answer to, and then find the information in the textbook. Most people learn and memorize best when they write this information down. I would write the question and the corresponding answer in a notebook, or develop your own word document that can be reviewed. After reviewing the CSCS exam content description and making sure you can confidently answer all questions associated with each domain, I would begin taking the CSCS practice questions from the NSCA. The more practice questions you can expose yourself to, the better your chance of success. Answering practice questions tests your knowledge, comprehension, and ability to recall key points. Practice questions also clearly identify deficits in your knowledge base, and suggest areas that need further review. Additionally, understanding the rationale behind correct/incorrect answers will reinforce the requisite information of the CSCS exam and aid in comprehension. A candidate should expose themselves to as many CSCS practice questions as they can find before sitting for the actual exam. If you can easily answer the CSCS practice questions from the NSCA, you are ready to take the actual test. If you miss a significant amount of the practice questions, or have trouble with a particular section or domain, go back and review that section in the textbook. After your review (If you miss a large amount of the NSCA practice questions), I recommend finding additional practice questions to test your ability before sitting for the actual exam. These will have to come from third parties as the NSCA only puts out a limited amount of practice questions. Remember, this is not a bad thing as the more practice questions you can expose yourself to, the better your chance of success. No matter how well you do on the CSCS practice exams from the NSCA, answering more questions won’t hurt and can only help. Nobody wants to have to take the CSCS exam again and pay the additional costs. If you miss multiple practice questions or do poorly on particular sections or domains, go back and review that part in the textbook, then find additional practice questions from third parties. No matter how well you do on the CSCS practice questions from the NSCA, answering more questions won’t hurt and can only help. A candidate may want to purchase a CSCS study guide. A good study guide creates value by maximizing the utility and efficiency of your CSCS exam preparation strategy. The preparation text Essentials of Strength Training and Conditioning contains 735 pages spread across 24 chapters. Simply memorizing every word in this text is a task very few of us can complete, and frankly it’s not necessary. You should not just study for the CSCS exam; you should study the right things. Based on the CSCS exam content description, a good study guide pulls out the requisite information from the preparation text and puts it into a more manageable format. To put this another way, a study guide consolidates the relevant information and presents it in a more accessible manner. This presentation should allow for quick review, application, and memorization. The second benefit of a good study guide is additional practice questions. 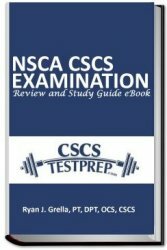 NSCA CSCS Examination Review and Study Guide eBook. Comprised of 373 pages this eBook contains a bulleted outline of all 24 chapters of the preparation text Essentials of Strength Training and Conditioning, as well as 550 multiple choice practice questions including two simulated practice tests Please click here to learn more.